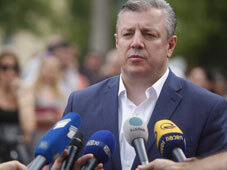 Prime Minister of Georgia Giorgi Kvirikashvili urged City Council Member Aleksandre Elisashvili to provide relevant information to the Prosecutor's Office after he clamed that he is in danger. The head of the Government stated that the member of the City Council may be questioned and law-enforcement agencies will take actions prescribed by the law in case of any threat. According to the Prime Minister, Elisashvili has the right to address the Prosecutor’s Office if any kind of pressure is being exerted over him. Kvirikashvili mentioned that Elisashvili has made statements about pressure on him in the past. “I do not say that this is a similar case, but if such need exists, anyone has the right to submit relevant information to the country’s law enforcement agencies," the Prime Minister noted. Aleko Elisashvili said that he is being sent messages that he and his relatives and family members are in danger and ‘advise’ him to be careful. He claims that the messages are sent by the Ministry of Internal Affairs, and so holds the ruling party, Georgian Dream, and the former Prime Minister of Georgia and founder of the party, Bidzina Ivanishvili, responsible. “I am being sent messages that I am in danger, that they are getting some things ready for me according to Bidzina Ivanisvhili’s instructions,” Elisashvili wrote on social networks. He believes that the government and the ruling party should think why he has become such an uncompromising opposition representative. “I did not make such statements because I want to attract attention. If anyone is planning something bad towards me, I want them to know that I am aware of it,” said Elisashvili without naming anyone specific. Majority MP Gia Volksi believes Elisashvili’s actions are “childish”.